After publishing yesterday’s article, I felt I had provided the readers with a lot of information to consider with regard to the growing South China Sea controversy. It is a controversy that will soon see American warships entering into the region. A few hours after publishing the previous article, I had an epiphany. I was mentally replaying the geographic area of contention in my mind and in my “Ah ha” moment, I began to wonder if the aggressiveness on display by the Chinese might have something to do with unhinging the Trans Pacific Partnership (TPP). While appearing as a guest on the Hagmann and Hagmann Report last night, at the end of the interview, I speculated as to whether China’s building of militarized, artificial Islands could possibly have anything to do with disrupting the TPP in favor of the newer BRICS hegemony? In the paragraphs below lies the analysis of this hypothesis. One look at the TPP and on can see the fingerprints of the Federal Reserve Board all over it. The TPP does what the Federal Reserve Board has been doing covertly for decades. It erases national sovereignty and civil liberties. However, instead of using the Trilateral Commission and the Council on Foreign Relations to accomplish this goal, the TPP is the creation of an illegal treaty which has unconstitutionally bypassed the US Senate and has not obtained the requisite tw0-thirds majority approval vote. In short, the TPP is a corporate dictatorship which obliterates any idea of representative government and civil liberties. The TPP has formally announced it is actively securing more partners (i.e. nations which seek to renounce their national sovereignty). But also, take a long look at the geographic area that most of the TPP participants are from. The majority, tw0-thirds of the members, inhabit the South China Sea region. The conclusion is obvious, the Chinese are constructing militarized Islands and laying false claims of ownership to a series of disputed Islands and are deliberately putting themselves in conflict with TPP members. In short, China is doing its best to disrupt the TPP. This is a major blow to what is left of the US economy. Please examine two items which lie below. 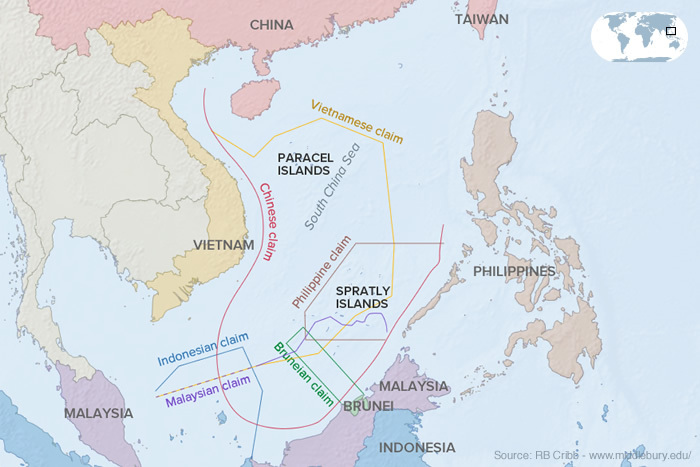 First, please examine the following map of the South China Sea region which depicts many members of the TPP. Just out of view of the map, lies other nations that are signatories to the TPP (e.g. New Zealand). Second, please look at statement from the White House regarding the large economic impact from the TPP on the American economy. It will become clear to the reader that any attack upon the TPP by China, is a direct attack upon the economy of the United States. What China is doing in the South China Sea is an act of war. However, China would argue that the US is undermining China’s influence in its own backyard and that, too, is an act of war on its face. It is a kind of Cuban Missile Crisis in reverse, but instead of the US planting missiles in China’s backyard, the US is undermining the Chinese economy with this provocative trade agreement which undercuts Chinese regional influence in East Asia. Seven of the 11 TPP nations are connected to the South China Sea. The facts speak for themselves as the economic impact of the TPP on the American economy is significant. It is the age-old question of what came first the chicken (the BRICS) or the egg (the TPP). This is a very easy question to answer. The following words were written in very early 2013 on the Daily Kos. These words, as it turned out, were highly prophetic. “Right now, the US Dollar makes up 2/3rds of the worlds global reserve currency. This is because nearly every oil-exporting country in the world exclusively sells their oil in dollars, so nations are forced to hoard large amounts of the dollar. “There are two countries that don’t sell their oil in the dollar: Syria, and Iran. As I stated in yesterday’s article, this has always been about the Petrodollar and the Federal Reserve keeping its Federal Reserve Notes afloat by remaining the World’s reserve currency. The Russians and the Chinese and a whole lot of other people have very different ideas. The BRICS were born in 2012 when Iran began to sell its oil for gold to Russia, China, and India. The TPP, according to the White House was formally conceived in 2009. Therefore, the egg preceded the proverbial chicken. Subsequently, China’s foreign policy in the South China Sea is a reaction to the undermining of the Chinese regional economic influence being taken away by the TPP. In the near future, look for China to blockade TPP’s open seas shipping in the region. And what about Taiwan? If the TPP is disrupted by a Chinese naval blockade, the economic impact will be felt in Taiwan. 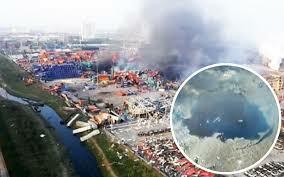 Tianjin explosion resulting from the rods from God. Now I fully understand why the US unleashed the Rods from God. It was not just because the Chinese decoupled their currency from the dollar. The United States attacked China in a demonstration of force, as a deterrent to the increasing militarization of the South China Sea by the Chinese Navy. And if I am incorrect about China being willing to go to war over the implementation of the TPP in their backyard, then why is the globalist mouthpiece,The Brookings Institute calling for China to join the TPP? The article was written last week. What is good for the goose (China) is good for the gander (Russia). While China is employing a strategy of intimidation and possible blockade in response to the TPP, the Russians are doing the exact same thing on the other side of the world. This will be the topic of the next part of this series. This entry was posted on October 15, 2015 by conspiracyanalyst in Asia, China, Global Government, International News, Trans-Pacific Partnership, War & Peace, World War III and tagged China, Trans-Pacific Partnership, World War III.